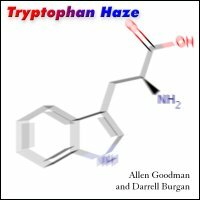 Tryptophan Haze is a set of three live ambient improvisations performed by Allen Goodman and Darrell Burgan on November 24, 2007, live on StillStream.com before an internet audience from around the globe. The story goes like this. One day, on a lark the artists decided to do several live improvisations on Darrell's net radio program on StillStream.com, only a few hours before the broadcast began. Despite the last minute nature of their setup, these performances were the result. After the broadcast, Allen and Darrell both felt that the performances that night were special and needed to be released, hence this album. Part One is a solo improvisation performed by Allen; similarly, Part Two is an improvisational solo performance by Darrell. Many kudos to Cockos Incorporated for making such an incredibly useful tool available freely to the community!